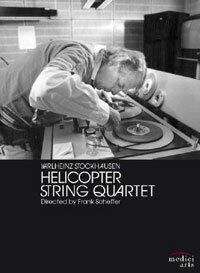 “Dedicated to all astronauts,” the Helicopter String Quartet was inspired by a couple of whimsical dreams German composer Karlheinz Stockhausen (1928-2007) had about classical musicians flying, and a completely liberated version of himself soaring free above a genteel, tuxedo-choked society. When the Salzburg Festival comissioned a new work in 1991 as a part of Stockhausen’s opera cycle Mittwoch from Licht, what else could he do, other than compose a piece that literally flew away? By 1995, the work was completed and ready for its world premiere by the Arditti String Quartet, consisting of violinists Irvine Arditti and Graeme Jennings, violist Garth Knox and cellist Rohan de Saram. Inside one of four cramped helicopters–each containing a recording engineer and a video camera–a musician furiously sawed away on his instrument as they slowly circled above Amsterdam. Back in the concert hall, the composer mixed the sounds of the four players together with the noise of the helicopter rotors into a strange, hovering, glissing entity that soared and dived as effortlessly as an albatross in bright, sunlit skies. The audience was also treated to a live video feed from the helicopters displayed on a Jumbotron™. The fact that this super-complex event–a Herculean logistical challenge–was perfectly realized is astounding. Even though his first name reminds me of ketchup, Karlheinz Stockhausen (1928-2007) remains a large fixture in the Food / Music section of my brain for another reason: as the man responsible for assembling one of my favorite pieces of electronic music ever, Hymnen (especially the ecstatically screaming drones in the Fourth Region), from 1965. Just four years after that epic work, Heinz had another musical revelation during a car ride on tour in New England: he jotted down on an envelope one simple musical formula that would be repeated over a long time. This piece, Mantra, marked a return to completely notated works to reign in his touring group, various members of which questioned who really was the creator–composer or performers–of the so-called intuitive music they had been partially improvising over the past several years. Spread out like ketchup over a 67-minute wide sandwich and harking back to the composer’s early serialism-inspired years, Mantra’s construction encourages two dueling pianists to produce a wide pallet of aural treats: from meditative to explosive, electronically treated with a ring modulator-like digital effect. This strange sound is occasionally accented with woodblock chops and crotale pings with a few spaceship gurgles thrown into the mix. The sonic variety comes as quite a surprise, considering the score’s simple economy. 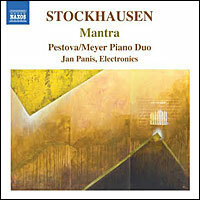 The passionate playing of pianists Xenia Pestova and Pascal Meyer and its electronic transformation by Jan Panis make this first-ever all-digital 2009 recording of Mantra really shine. Really alien-spirited, “Kontakte” (1960) is a highly abstract sounding storm of purely screwed, echoing electronic soundscapes—especially suited for long evenings of deep headphone soak. Enhanced by the piano bonk of computer music pioneer James Tenney and the classically trained percussion pound of William Winant, this 1978 recording is one hell of a ride through dark, flying saucer hangar haze. “From the philosophical angle, ‘Kontakte’ illustrates par excellence the powerful continuum which may be created between the durational structure of [sound] events and the timbre of the events themselves. In discussing impulse generation a little earlier, a basic relationship was established between the timing of components in a cyclic pattern and the resultant quality of the sound produced. At sub-audio speeds, the components become events in their own right, the ‘atomic’ structure thus being revealed as a rhythmic force. 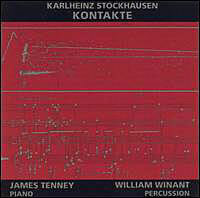 You are currently browsing the archives for the Karlheinz Stockhausen category.